Rosette clasp marked choral rhodium plated. Length Approx 44 cm. Beautiful Double Strand Carnelian, Yellow Agate & Coral Sterling Silver (925) Necklace. Item will be presented in red pouch. 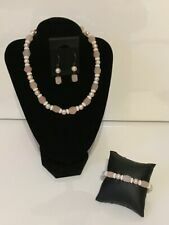 For Sale Matching Jewellery Set as per photographs - Just stunning cut on these Rose quartz stone beads added with the soft touch of the peach Fresh water pearls and white glass disc spacers - 44.5mm Necklace with copper plated chain and clasp. Metal: CopperStyle: Strand/StringLength: 16 - 17.99"
98 QUARTZES- 105.00 CTW, BEADED, PALE PINK, 4 mm. 1 QUARTZ- 27.15 CTW, FACETED, ROSY PINK, 2.7 cm. 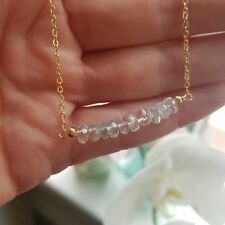 AQUAMARINE MARCH BIRTHSTONE NECKLACE. Aquamarine is the birthstone for March. Designed and handmade by Nancy Laverge. 17 1/2 ". 44 CM LONG. Graduated size beads 10 mm to 20 mm. 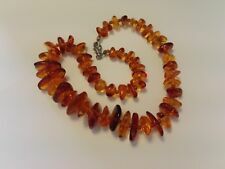 Superb amber bead necklace with tiny amber spacers. Length adjustable 42 - 46cm. 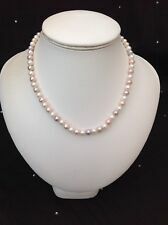 Freshwater Pearl Multi Strand Necklace. Real freshwater pearls. Sterling silver fittings. 16 ". 41 CM LONG. PALE GREEN DYED QUARTZ. TWISTED OVAL 13 MM LONG AND TWISTED CUBE 8 MM LONG WITH GOLD PLATED SPACERS. AND A HEART SHAPED TOGGLE CLASP.ALSO MATCHING EARRINGS. 16.5 ". 41 CM LONG. QUARTZ- FACETED BEADS, PALE PINK. 22.5 GRAMS, 925 SOLID STERLING SILVER, LOBSTER CLAW. 31 TOPAZES - 130.20 CTW, BEADED, SMOKY ( BROWN ). 24 TIGERS EYE - 7 mm, BEADED, BROWN. 8 CULTURED FRESHWATER PEARLS- 6 mm, BEIGE. Est. delivery dateEst. delivery Sun, Apr 28Metal: Sterling SilverStyle: Strand/StringLength: 16 - 17.99"
STUNNING BE-JEWELLED STERLING SILVER, MULTI GEM STONE, AMBER, PEARL, TURQUOISE, LAPIS NECKLACE. The striking necklace fastens with an adjustable extension chain and a hook clasp. Style: Strand/StringBrand: HandmadeLength: 16 - 17.99"
Secondary Stone Fire Opals. Ethiopian fire opal oval beads 5mm on solid 14k yellow gold 1mm cable chain. Main Stone Shape Oval. Main Stone Color Gold. Hope you could undersand. hope you understand. This special red colorsymbolizes “blood.”. This gemstone is useful when you want to have energy for your life or sweep away sluggishness. It may bring back owner's energy to the right condition. GENUINE NATURAL RED CORAL 4 STRAND BRAIDED NECKLACE 5MM 23"
Main Stone Coral. Thickness: 5mm (apprx. Main Stone Color Red. ). Natural Australian opal graduated rondelle (rondell, rhondel) beads. Main Stone Shape rondelle. Main Stone Australian Opal. 16" strand on silk adjustable to 20" ready to wear. You get one of the strands shown for quantity one. Royal 20 Strand Genuine Moghul Style Spinel Necklace. Gemstone : Genuine Black Spinel necklace. -- More About The necklace--. Solid 14k yellow gold spring clasp and accent beads. Secondary Stone Lapis Lazuli. Main Stone Lapis Lazuli. These natural lapis beads have an wonderful deep dark blue. 14k yellow gold beads and slide cylinder clasp with safety latch. Hallmarks: 14k with heat pattern maker's mark. Approx Carat Weight - 175 Cts. Approx Round Bead Size of Pearl - 6mm. Origin - Brazilian Mines and Pearl from China. Approx Pear Drop Bead Size - 28mm 15mm. Shape - Round and Pear Drop. Stunning Blue Topaz necklace. 25ct London Blue Topaz faceted 3.5mm rondelle stones and a big Briolette cut London blue Topaz center stone 12mm. Has two 5mm solid 14k accents and 2mm 14k accents and a solid 14k spring clasp. Beautiful necklace, tons of sparkle and fire. Over 21 carats of 3mm rondelle shaped London blue Topaz and three 6mm oval shaped 2cts of Natural untreated Ethiopian fire opals. All solid 14k gold accent beads and spring clasp. 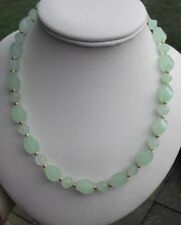 Up for sale is a lovely aquamarine and 18K yellow gold choker necklace, signed S M Jtm. Signed SM Jtm. Secondary Stone Aquamarine. Main Stone Aquamarine. Natural aquamarines are graduated in size, fantasy-cut with multiple facets, arranged in a strand with yellow gold floral roundelles and heart-shaped clasp. The number of silver strands and rose quartz beads varies from strand to strand. Sterling Silver & Rose Quartz Multiple Strand Necklace. Each strand contains between 19 and 39 4.76mm Rose Quartz Beads. Stunning Genuine 25ct Tanzanite faceted rondelle beads 3mm-4mm and three trillion cut 5mm - 7mm center stones (4cts) with 2mm and 3.5mm solid 14k gold flower bead accents and a solid 14k clasp. Main Stone Shape Trillion. MODERN 18KT YELLOW GOLD NECKLACE. STATION BY THE YARD DESIGN. FEATURES 13.68 CARATS OF NATURAL SLEEPING BEAUTY TURQUOISE. WRITTEN APPRAISAL SERVICE AVAILABLE. Jewels By Sam | Fine Modern & Estate Jewelry. Solid 14k yellow gold spring clasp and accent beads. Main Stone Shape Pear. Solid 14k yellow gold spring clasp, 5mm accent beads and 2mm cable chain. Main Stone Shape Pear. ESTATE 18K YELLOW GOLD NECKLACE. STUDDED CLOVER DESIGN. FEATURES BLACK ONYX CENTER. LOBSTER LOCK. WRITTEN APPRAISAL SERVICE AVAILABLE. Jewels By Sam | Fine Modern & Estate Jewelry. Main Stone Onyx. 10CTS of Briolette pear shaped 7mm Blue Topaz with solid 14k wave beads. Main Stone Shape Briolette. Main Stone Topaz. Bead Size: 5x3 - 24x16 MM. Gross Weight: 206 Carat. Approx Bead Size of Blue Sapphire - 9mm. Main Stone Blue Sapphire. Main Stone Shape Round. Main Stone Color Blue. Main Stone Creation Natural. Code - BD-737. Clasp - Sterling Silver. Natural Australian opal graduated rondelle (rondell, rhondel) beads. Main Stone Shape rondelle. Main Stone Australian Opal. 16" strand on silk adjustable to 20" ready to wear. bead size 3-6 mm. You get one of the strands shown for quantity one. Solid 14k yellow gold spring clasp. Beautiful necklace, tons of sparkle and fire. Over 21 carats of 4mm faceted rondelle shaped Tanzanite and 6mm oval shaped 2cts of pink Ethiopian fire opals. All solid 14k gold accent beads and spring clasp. Center stone is a 10mm London Blue Topaz 2ct briolette shaped gemstone. The strand is blue quartz faceted rondelle beads(3mm). the accent gemstones are 5mm Pear cut Ethiopian Fire Opals. Necklace has all solid 14k accent beads and solid 14k spring clasp. Stunning Genuine 25ct Tanzanite faceted rondelle beads(3mm) and. 6ct Pave Genuine Diamond necklace. Main Stone Tanzanite. Main Stone Color Purple.